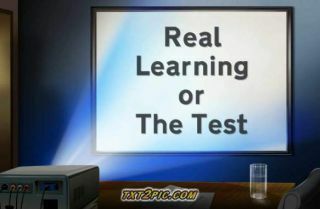 Forget Real Learning?? … Get Them Ready For The Test???? 1. Inquiry, problem solving, metacognition, reflection…. providing the facts is more time efficent ? ?… get them ready for the test?? 2. Relationship building to grow a culture of learning… this can’t be found on an exam?? … get them ready for the test?? 3. Teaching to the “Whole New Mind”… the right brain takes away too much time? ?… get them ready for the test?? 4. Putting children at center of their learning, they may be way too inexperienced? ?… get them ready for the test?? 5. Make connections with the real world, isn’t it all in the textbook? ?… get them ready for the test?? 6. Connecting disciplines and real world to bring about authentic learning…. isn’t there a good video for this ? ?… get them ready for the test?? 7. Collaboration with other students to focus on learning, doesn’t the teacher have all the knowledge? ?… get them ready for the test?? 8. Technology integration to facilitate deeper learning… shouldn’t a worksheet provide the learning neccessary?? … get them ready for the test?? 9. Experiencing a multitude of learning experiences…. doesn’t this take away valuable lecture time ? ?… get them ready for the test?? 10. Dive into Bloom’s Taxonomy or Webb’s DOK, why won’t Pavlov’s conditioning get the job done ? ?… get them ready for the test?? OK, I couldn’t stop at ten? ?… so I saved the best for last?? 11. Their future, what’s the matter with our past? ?… get them ready for the test?????? ?